10. William Henry Harrison (D, W) - Unlike yours truly, this guy gave such dull speeches that he dropped dead shortly after his own inaugural address. Total loser. 9. Francis Delanor Roosevelt (D) - Talk about boring, Feeble Frank couldn't even walk. All day, he'd sit around doing nothing. And when he wasn't taking long naps in his chair or staring at the wall? Feeble Frank managed to get us into one of the bloodiest wars in history! Millions were killed! So sad. 8. Millard P. Fillmore (W, KN) - In case you're wondering, those letters in parentheses after Millard's name refer to the Whig and Know Nothing parties, both of which failed while this bald dummy was a member. Coincidence? 7. 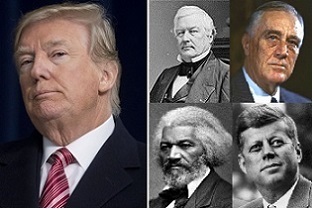 Frederick Douglass (D) - Little known fact, this guy actually lived way back in the 18th century and is dead now. Little known because he didn't make much of a mark. Was probably anti-slavery, but evidently didn't do much about it. Shame. Trump promised to finish his list next week.